The Back Room at Kim’s Corner Food is an experimental art space and repository for thousands of collage and assemblage works made by artist Thomas Kong over the past decade. Housed in an adapted storage room behind the convenience store Kong manages in Rogers Park, The Back Room began as a collaboration between Kong and artist Dan Miller in 2015, with assistance from Nathan Abhalter Smith. 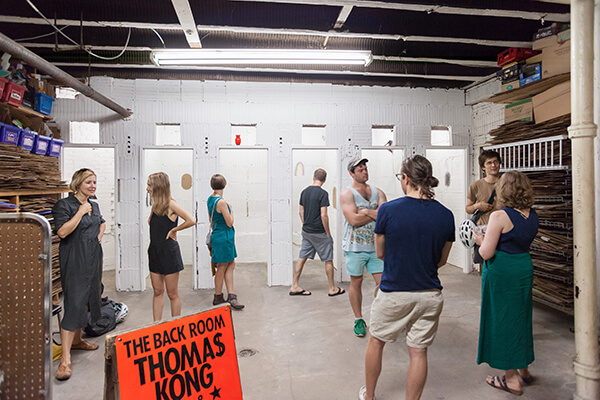 The Back Room has since invited artists and thinkers whose practices intersect with Kong’s in various ways to produce an ongoing series of public exhibitions, events and performances in the space. These projects each proceed from a horizontal engagement with Kong’s unique art practice and working context, and the projects are intended to develop conversations around the art field’s relationship to production, visibility, history, hierarchy and value.